Blood Rhythm – GET YOUR PAWS OUT OF THE GOBLET, ALIECAT! 2-CD benefit compilation where Industry8’s profits go to PAWS (Philadelphia Animal Welfare Society). 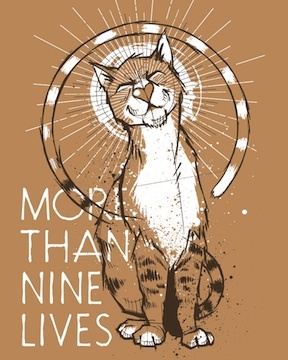 More Than Nine Lives, the second release from Industry 8 is a specially priced two disc compilation. All profits are to benefit PAWS (Philadelphia Animal Wellness Society), the only no-kill shelter in Philadelphia. Curated by Dean Troxell and Joe Scott, the dark music experts from Philadelphia’s Digital Ferret Music Store, the compilation is a showcase of some of the most exciting artists in post punk, minimal wave, experimental, rhythmic noise and death rock. The 36 tracks spanning the two discs bring exclusive tracks from established genre leaders like darkwave icons Black Tape for A Blue Girl to artists who make their cd debut such as the experimental Blood Rhythm. Ambitious in its selection and scope but unified in theme and vitality, More Than Nine Lives is a glimpse at what is at the forefront of the dark music genres in 2011. Whether you enjoy this compilation for the music or the cause, remember it’s limited to 500 copies and has undeniably endearing cover artwork from Mike Wohlberg. Includes an exclusive track from Black Tape For A Blue Girl: “CaughtStranger.” This is an instrumental remix of “Caught by a Stranger” off the 10 Neurotics album (now available on the Tenderotics CD). Mix by Sam. It has a sort of Peter Gabriel-y feeling. Also good for belly dancing!